I bought a 10 sachet box of Forever Nuts when DavidsTea was discontinuing their sachet style, it was 40% off the original retail price, which made it cheaper than the loose leaf or new sachet style. The only downside is that the old style is not as environmentally friendly as the newer style with the biodegradable packaging. But an herbal infusion is an herbal infusion, and Forever Nuts is still Forever Nuts regardless of how you change the packaging. When I opened the packaging, the smell is delicious! The herbal infusion smells heavily of apples and cinnamon (what a perfect combination!) followed by the lovely fragrance of almonds. I tried Forever Nuts before with a store sampling, so I knew what crazy pink colour it steeps to. Forever Nuts consists of: apple, almonds, cinnamon, beetroot, and artificial flavouring. The top three ingredients are noticeably present, but the beetroot not so much in terms of aroma. My sister commented that the ingredients made it look more like a trail mix than something to drink – she’s kind of got a point since it is an herbal infusion and not an actual tea, it has a lot of yummy bits in it that would look right at home in a granola mix. 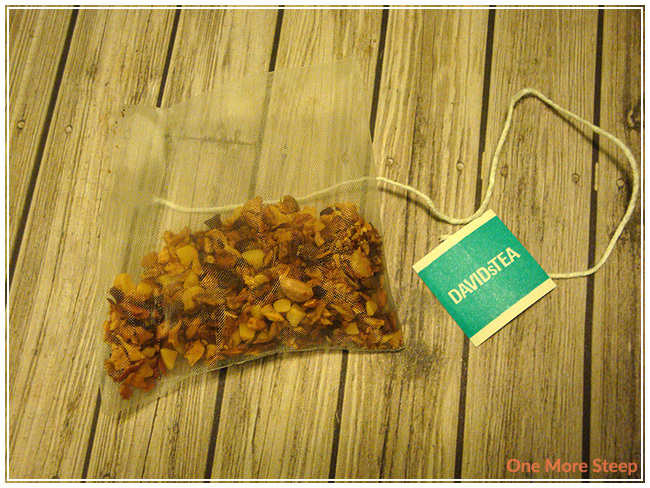 DavidsTea recommends steeping Forever Nuts in 96C (204F) water for 4-7 minutes. I steeped for close to 6 minutes in total. The colour of Forever Nuts can be surprising if you’re not really expecting it. It steeps to a deep pink, thanks to the beetroot as part of the ingredients. The smell itself smells of apples, cinnamon, and almonds. There’s also some hints of vanilla in the aroma of the steeped herbal infusion, which I quite enjoy. The taste itself of Forever Nuts leans heavily towards the apple and cinnamon. The flavour of almonds is present, but it’s overwhelmed by the combination of apple and cinnamon. There is a level of sweetness to the infusion that I would say might be from the apples since sugar is not listed as part of the ingredients. With some blends that contain apple, there’s often a tartness from the fruit – I don’t find that with this one, which is good because it wouldn’t go well with the cinnamon or almonds. The overall smell of the tea reminds me a lot of apple pie, and the taste is delightfully pleasant. I do get the almond in the taste of the tea, but ultimately it’s the apple and cinnamon that stands out. Forever Nuts does not resteep well – as an herbal infusion I also didn’t really expect it too since it doesn’t steep the same way that a tea does. 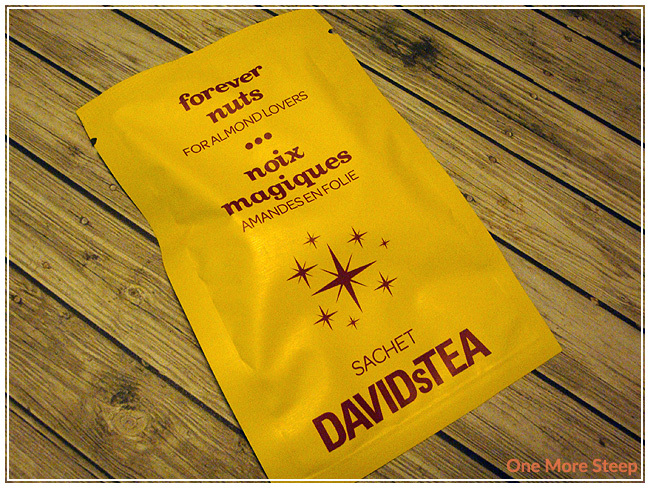 I liked DavidsTea’s Forever Nuts. 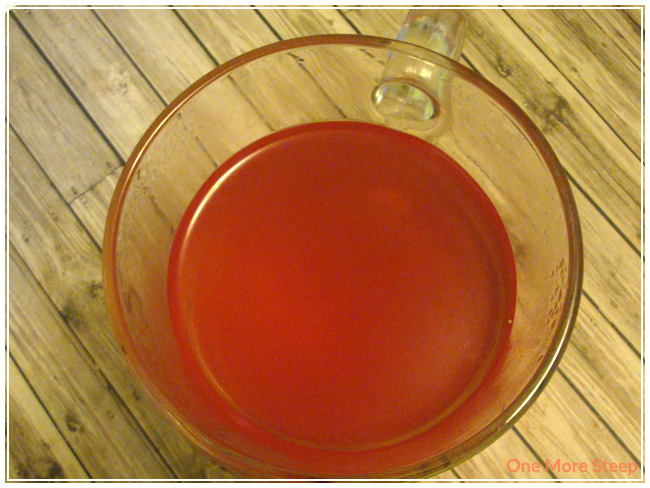 It’s a very fun herbal infusion, with the bright pink colour and the amazing flavour that reminds me a lot of apple pie (or apple crumble, or any other apple-and-cinnamon dessert that you can think of). I find that the almond gets overpowered easily by the apple and cinnamon combination, but the flavour is still there. If the almond was more present, I think I would have ranked it a bit higher. Overall, I think Forever Nuts works well as a dessert drink since it does have a level of sweetness that doesn’t require additional sweetener. The nice bonus is that as an herbal infusion it is naturally caffeine free and can be enjoyed throughout the day and won’t keep you up!